Note: If you are using level 2+ Golemn and using Wizards/Witches/Valkyries at the end of the attack or you are a Town Hall 8 using Dragon attacks, you can skip steps 1-3. 1 Defense = 4 Hog Riders. 2 Defenses = 4 Balloons + 1 Hog Rider. 2 Defenses + Double Giant Bombs = 6 Hogs. Using Giants for luring Clan troops out is not bad but in some cases Giants need to break the Walls in order to attract the Clan troops. Hog Riders and Balloons can do this job much easier. Poison Spell on the defensive troop squad. If your can’t use the Poison Spell in the battle or you want to know which troops can survive a Poison Spell, the guide Some Tips for Luring Clan Troops will give you more details! You can skip this step If you are using Dragons. Tankers are Golems, Lava Hounds or even your Barbarian King If you don’t have Golems for ground raids. Don’t mess this step up because the next step depends on how you place your tankers a lot. Think clearly before deploying your tankers, ensure that they will attract the appropriate buildings and draw an beautiful path you desire. If you are using Dragons, you should see the Dragon Attack Strategies Inforgraphic, It will give you plenty of valuable experiences about Mass-Dragon Attack Strategy and all variations of it. 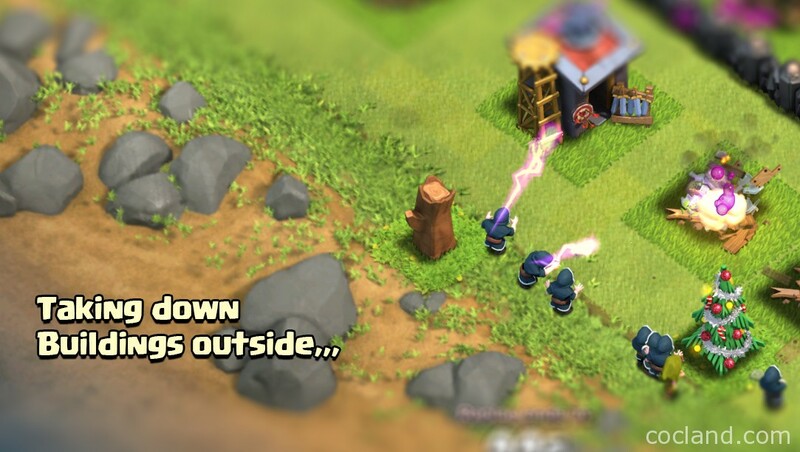 For the majority of TH 9 ground raids, you should deploy a few Wizards to take down all outside buildings to prevent your Heroes from going around the base instead of going into the core to take down the enemy Queen and key defensive buildings. If you are going with air attacks, use Minions instead of Wizards. Always look for opportunities to use your Minions for taking down unprotected buildings outside the bases. Don’t let your Wizards die is your duty at this step. You need to establish your funnel at this step or you will have no more than 1 star win. You can skip this at Town Hall 8 or If you are using air attacks. Once you establish the funnel, it’s time for Wall Breakers and Jump Spell/Earthquake Spell to open the base. A maxed bomb can kill your Wall Breakers so always deploy extra WBs at this step. (For example, take 3 to destroy Skull Walls and 4 for Lego walls). Deploy 1 WB for testing the coast at first. Ensure that your Tankers at step 2 can protect your Wall Breakers and always pay attention to the Mortars. has been being the best tool to crack and open any base. You can read the detailed guide about How to use the Earthquake Spell by Ash for more details. Additional troops can be the Witches, Wizards, Valkyries or other troops which can be placed once you have finished the 4th step. If you are using Jump Spell, don’t place these troops before dropping the Spell. Level 2 Jump Spell gives you up to 40 seconds so you don’t have to rush at all. Support Spells are very important for the current squad. If you don’t kill the Clan troops at the first step, this is where you need to do that job. You can use Rage or Poison Spell at this step (IMO Poison Spell is much better). If you are using Valkyries, you should deploy a Healing Spell at this step. Don’t hesitate to use your Hero abilities in the battle If they are needed. Players sometimes forget them and their abilities after these opening steps. Make sure that you are using their skills before finishing all steps in this guide unless you are an elite player. Above are 7 steps you need to remember whenever want to you attack a base and absolutely don’t change the order them. Your next steps will be spending Hog Riders, P.E.K.K.As, Balloons,… and all other main troops of the attack, dropping Spells to support them, etc… and using Cleanup troops at the end of the attacks.